Day 13 of the the 30 lipsticks in 30 days project features a really cheap but great lipstick from NYX Cosmetics. This is the NYX Round Lipstick which was a gift from a friend but a line I would consider getting more from. 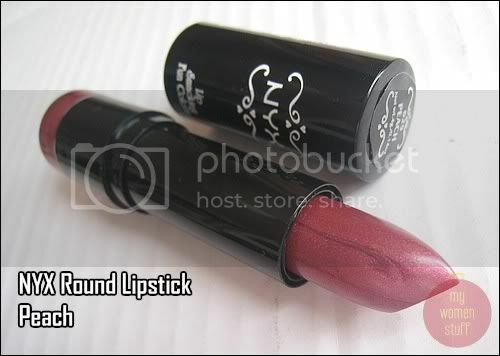 When I first saw the name of the lipstick I thought they labeled the lipstick wrongly. The name was Peach but the colour was nowhere near Peach. In the tube its a metallic deep berry. Again I did a double take but yep! It says Peach on the label. The NYX Round Lipsticks apply smoothly and are lovely lipsticks especially when you consider the price. Its US$3.50 on the website and often goes on sale on various sites for US$1. At either price, its worth a purchase if you can share in an order some time. NYX Round lipsticks come in 144 shades so yeah, take your pick! 😀 NYX is available in Singapore or you could also check out the NYX Black Label lipsticks. Moving onto Day 14 with a lipstick from Bourjois. That is so clearly not a peachy color. But its lovely on ya! Though the color is not peachy at all, it still turns out good on you! sold! that looks like a gorgeous color!